As kids, the stock car racing town of Glen Oaks called them The Outlaws. Who knew the hoodlums on the street would grow up to be upstanding citizens? Their leader, Linc, has become a minister, but never got over his first love, Margo, now an atheist because of her upbringing in a religious cult. Beth is lonely after the death of her husband Danny, until Tucker, the man who blames himself for Danny’s death, comes to town. And Annie has overcome emotional and physical scars from her youthful marriage to Joe, but will her progress be enough when he reenters her life? In TRUST IN ME, troubled teen Ronny reunites them, and in trying to help the boy, the three couples uncover a passion for each other that can no longer be denied. 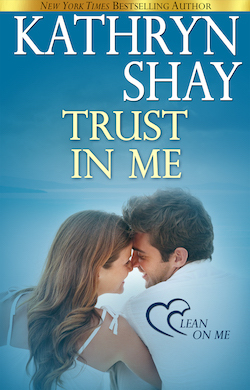 Reviewers say Kathryn Shay knows teenagers. As a high school teacher, she has dealt with troubled kids like those in this story. She also grew up in a small town, near a race car track.